So this is kind of a continuation of another thread I started, but this time about CO2 instead of about lighting. I am going to start a shrimp only 60l planted tank. From what I understand, CO2 is very beneficial for plant growth, but some people say that it can be harmful to shrimp. Is it really harmful? Yes your plants will do way better with co2 and also less problems of algae if you are going for med/high light plants. Depends if you are going DIY co2 or pressurized co2, with pressurized you can keep the co2 more stable. Yes a timer + magnet valve is necessary as plants don't use co2 when lights are off. It's very easy to accidentally gas Neo shrimp, and if the pH gets too low, they might not thrive as well as if they were in higher pH levels. Generally speaking, you either have a nice planted tank setup, or you have a shrimp tank. It can be a fine balancing act to have both. It really depends on your goals. Not sure all the specific species but I know some just do not like to breed in hi co2 levels. That's not to say they are not healthy. Lower levels are fine. Keep in mind a lot of shrimp species like hi o2 levels and co2 will bring those levels down. Is why it's always a good idea for good surface agitation in a shrimp tank. I run 15ppm co2 in my shrimp tank and all are doing very well. Been about 6 weeks since I've had them so hoping soon get the first berried CRS. The breeder I got mine from he has his in 15ppm co2 and his breed like crazy if that tells you anything. Again lower levels are fine. Zoidburg and Zoidburg like this. I agree with the previous comments. My shrimp were breeding like crazy when my C02 levels were lower. Now that I keep it at a consistent higher level the population is dropping. A timer is definitely beneficial imo. like hi o2 levels and co2 will bring those levels down. Is this true? I was under the impression that O2 and CO2 levels weren't related at all. Only that the surface agitation that would bring the O2 in, could also allow the CO2 to escape. As the water tries to "naturalize" against the conditions in the air(like the 24 hour PH drop check to measure Co2). But you could have high O2 and CO2 levels at the same time. I often read things in this hobby that directly contradicts each other, so I have no idea what to believe anymore. DutchTank and DutchTank like this. As a relatively new shrimp keeper who has been/is struggling with pressurized CO2 in the tank, my advice is this; focus on one thing at first. Yes, there are many people who successfully manage to run CO2 in their shrimp tanks. The odds of you becoming one of those people on your first try while you're still learning everything else there is to know about shrimp-keeping is low. Shrimp do not like high CO2 levels or pH swings (which injected CO2 on a timer will cause), so you're just stacking the deck against yourself by trying a high-tech shrimp tank on your first dance. 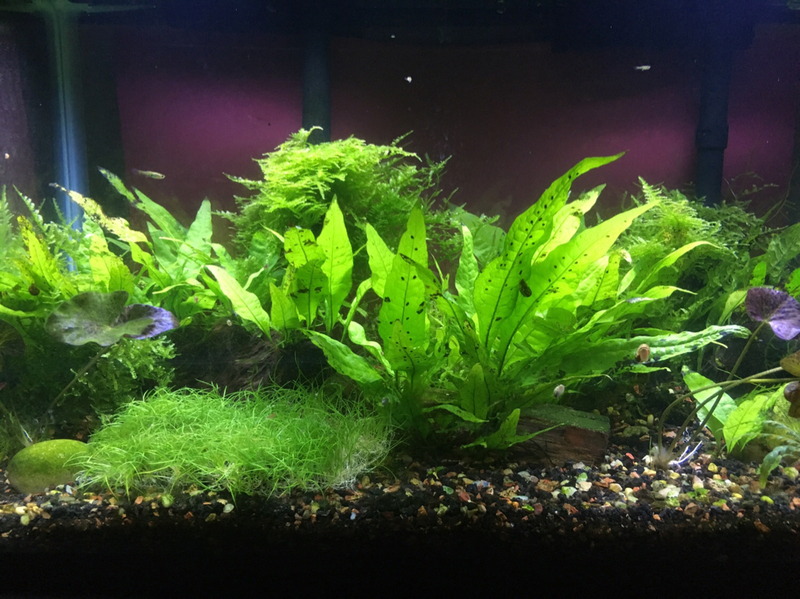 I would suggest focusing on either a high-tech planted tank or shrimp. Get comfortable with one before attempting the other. You can always get shrimp first and try to acclimate them slowly to CO2 later once they're comfortable in your tank, or you can grow a high-tech CO2 jungle with no shrimp, then go mid-tech and try to add them. I know this isn't the most exciting advice but watching your colony slowly die for unknown reasons over the course of weeks to months is really frustrating and discouraging (speaking from experience). Thanks so much guys. All your responses have been great and much appreciated! My main goal is to have a planted shrimp tank, but the shrimp are the more important thing. I think what I may do is start with a planted no-co2 tank. I watched some Rachel O'Leary videos and her non co2 tank seems to be doing fine. I understand that plants like Anubias don't require any extra co2 so I may make them part of the centerpiece. There are plenty of plants that don't need CO2, however if you want to get spectacular growth there really is no way around it. And that being said, I have shrimp in my tank and they particularly dislike CO2, yesterday one of my red shrimp was swimming around upside down and acting even more retarded than usual (cherry shrimp are incredibly stupid if you hadn't already realized) so I shut off the CO2, cranked up the light and made her swim towards the surface. She recovered pretty fast from the anoxia, but I can tell the CO2 and pH swings affect both the shrimp and the fish so I'll be applying it sparingly. You can have both!!! You don't need CO2. Stick with low light plants. Note: the hair grass is an experiment and I don't know if it will actually survive in this low light tank. I've successfully kept a very large colony of cherry shrimp in a high tech high co2 tank. What I noticed in all the previous posts was that people only mentioned timer/no timer. I used a pH controller that kept the co2 at a consistent level so that there were no overnight pH swings. Perhaps that was the difference. 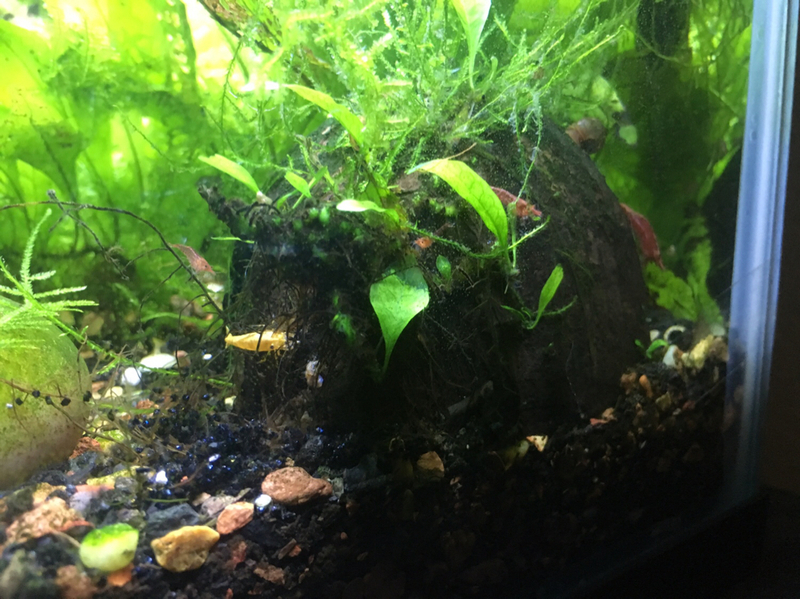 I wouldn't even say that it was a difficult balancing act between the plants and the shrimp because the pH controller did all the balancing for me. Zoidburg, Zoidburg, clownplanted and 1 others like this. I'll throw out my experiences as another data point. I have a CRS colony that I keep at 15 ppm CO2 on a timer from 9 AM to 4 PM - so pH swings .5 or so during that time. I dose just shy of half EI as well, and I haven't noticed any issues. I've had probably 100-120 babies a month for the past few months (5 full size females and one smaller one), and I moved about 80% out each month through sales / RAOK's. Have 3 currently berried right now (that I know of) and one that just hatched.